1. The first postcard is from the early 1900s, probably around 1905 in Sindh Province. The fishermen are getting read to swim out into the water using a "boatless" technology which involves floating on large round ceramic vessels and using hand-held sweep nets on forked poles. 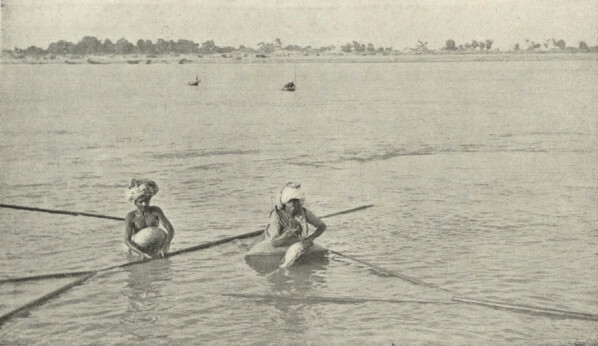 These men are most probably from the Mohana community in Sindh, who have been traditionally associated with fishing, boating and sailing along the southern Indus River. This persistence of the clay pot as a flotation device in the cultural memory is evidenced in the popular folk tale "Sohni Mahiwal", where a clay pot (ghaRaa) plays one of the key roles. Sohni uses a baked (pukkaa) clay pot as to float across the River Chenab on her nightly trysts to her beloved, Mahiwal. In an act of vengeance, her pot is replaced with a sun-dried (kachaa) clay pot, which disintegrates and dissolves as she is crossing the churning river on a stormy night. Sohni beseeches her pot to get her across, but the pot is unable to comply, and there is the inevitable tragic end when Mahiwal also jumps into the river to save her. 2. The second image is a more recent photograph of men returning with their catch. 3. 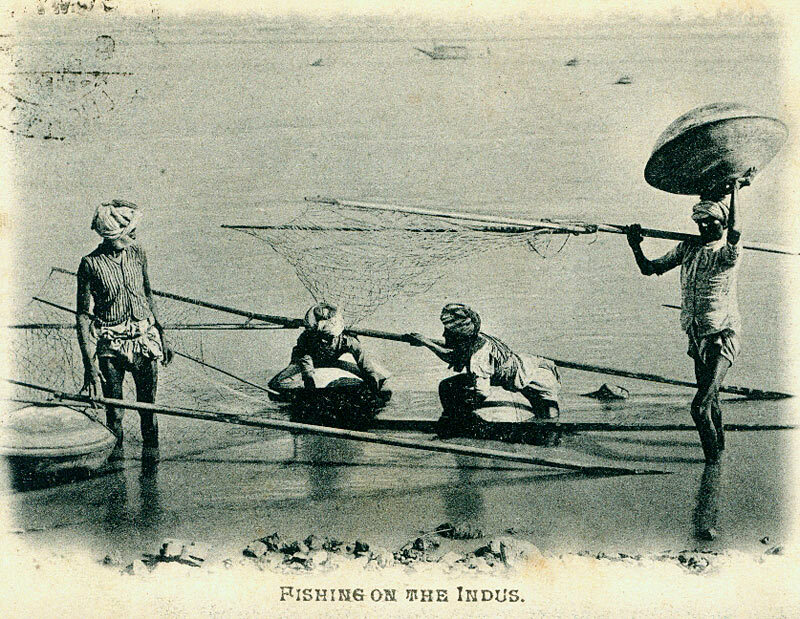 The third postcard, also from the early 1900s in Sindh, depicts the commercial end of the fishing expedition (shikar), albeit in a posed arrangement. The men seated the foreground are probably the fish mongers, getting read to sell their fish. 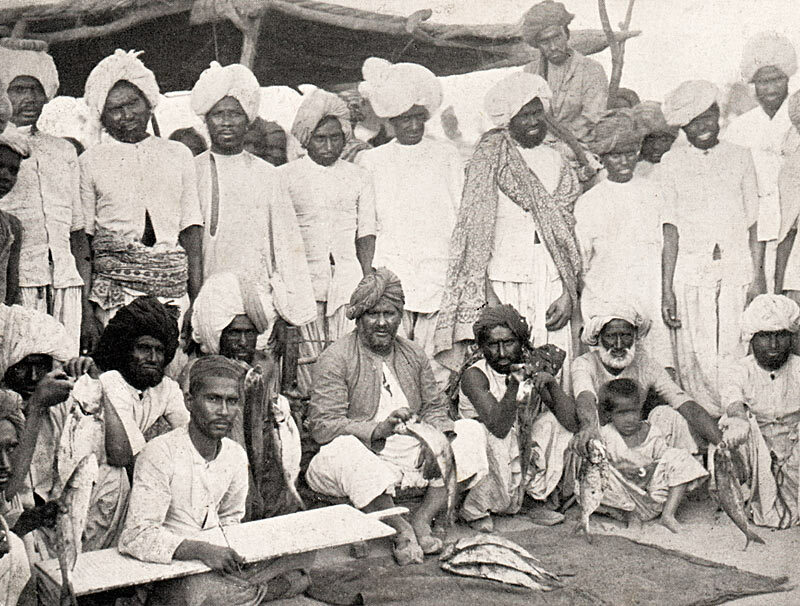 The man on the left holding the large writing board (takhti) may be the scribe who records information about the fish trading, perhaps keeping a record of the sales. Some of the men are holding up catfish, most likely of the species Rita rita. The pile of fish on the cloth look like a type of carp, possible Notopterus notopterus. 4. & 5. 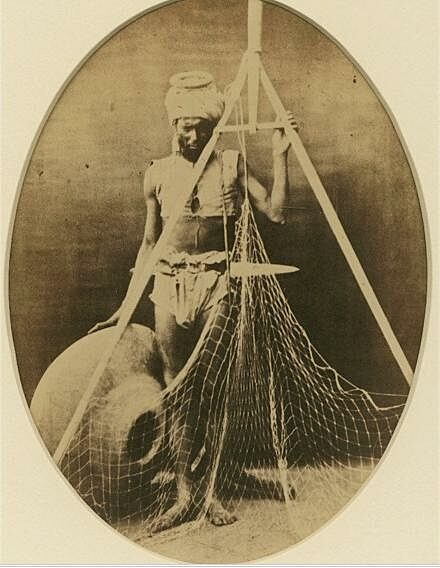 "In the photographs both the men are shown holding their nets with their triangular wooden frames, to which the net is attached. Plate 337-2  shows also the large earthen vessel which is their support in the water, where it is placed mouth downwards; and the fisherman, lying upon it on his stomach, strikes out into the stream in quest of prey. Much strength and dexterity is required in the management of the net, and in taking out the fish when caught; but the man is master of his craft. The best fish caught in the Indus is the palla, which is rich and delicate, with something the flavour, in season, of the salmon. 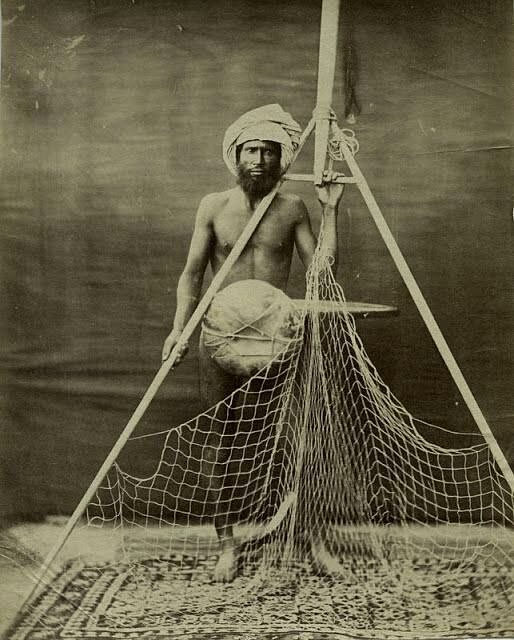 The nets shown are especially used for the capture of the palla." From The People of India A Series of Photographic Illustrations, with Descriptive Letterpress, of the Races and Tribes of Hindustan, Originally Prepared Under the Authority of The Government of India and Reproduced by Order of the Secretary of State for India in Council, 1868, Edited by J. Forbes Watson and John William Kaye, Vol. VI, pp. 235-236. Reprinted by Pagoda Tree Press, 2007. His research utilises ethnoarchaeological methods which involve studying current practices. He has shared some of this research with us in his recent slideshow on the Ravi fisheries, which is an excellent example of how he records modern fishing practices and fish species to relate them to the archaeological finds across different sites like Harappa, Balakot and Allahdino. Several of Dr. Belcher's articles have been featured on harappa.com. You can see one on fishing nets here , and another article comparing the material record between two sites, Balakot and Allahdino, to demonstrate differences in subsistence patterns, here.